Location: Streets and Pie shops of Portland, Oregon! This collaborative project involves a self-guided bike/walking tour of three different neighborhoods, leading to the best places to enjoy a slice of pie in the city! Inspired by the importance of community, sustainability and the DIY and DIT (do it together) culture of Portland, as well as the connections between printmaking and baking, (rollers, chemistry, patience) this tour encourages attendees to enjoy this city’s tradition of bicycle riding while supporting local businesses and looking at art! The project is a part of the Southern Graphics Council International annual conference, which this year is being held in Portland. 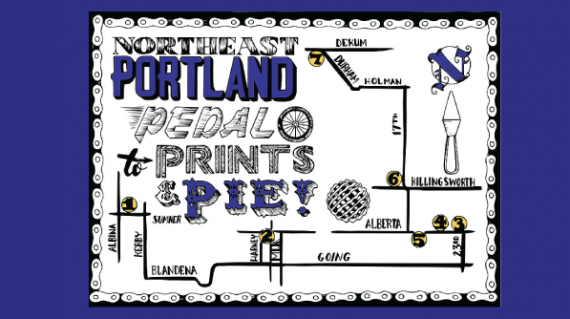 The project includes three Portland neighborhood maps (NE, SE, and Downtown) designating the best places for pie. The tour is self-guided and can take place at any point in the conference, March 30-April 2. You don’t need to be a part of the conference to join in and have a slice.